May 2nd, 2016 | News and Events, Wheaton World Wide Moving. Direct Lease Driver of the Month, Charles Leyrer, Schuylkill Haven, Pa., has 39 years of experience as a household goods driver. He maintains a top driver performance rating. This is Charles’ first Driver of the Month award. 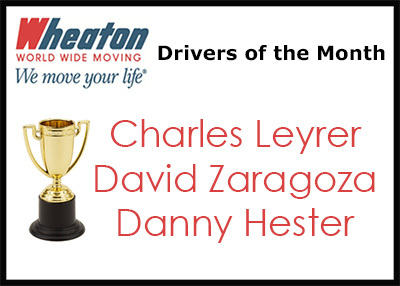 David Zaragoza, Preferred Movers of Nashville, Nashville, Tenn., earned Wheaton’s Permanent Fleet Driver of the Month award. David has eight years of experience as a professional household goods driver. He has maintained a top driver rating and this is his first Driver of the Month award. Danny Hester, Mather Brothers Moving Company, Garner, N.C., earned Wheaton’s Intermittent Fleet Driver of the Month award. Danny has 15 years of experience as a professional mover and this is his first Driver of the Month award.